Paddlefish; photo by Benson Kua on Flickr (use permitted with attribution / share alike). Missouri designated the paddlefish as the official state aquatic animal in 1997. 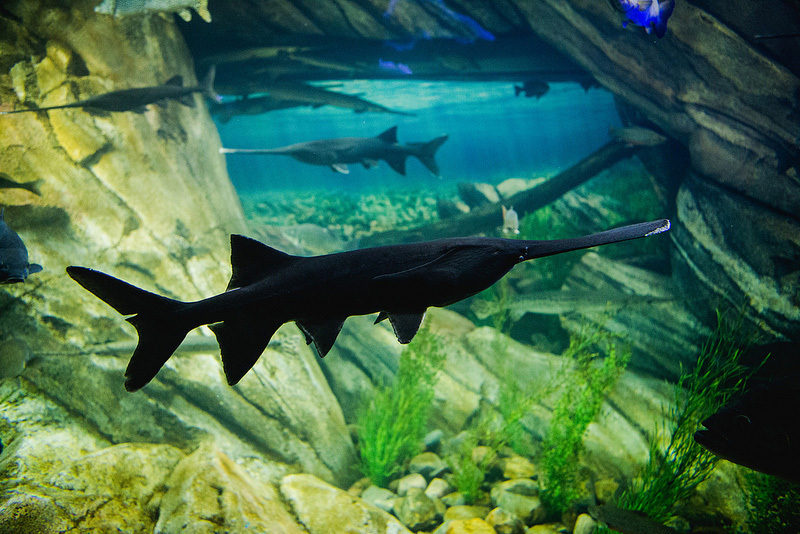 Paddlefish are one of the oldest fish known. Missouri has paddlefish in the slow-flowing waters of the Mississippi, Missouri and Osage rivers. The paddlefish (Polyodon spathulaas), also called a spoonbill, has a cartilage skeleton rather than bone. It has a large mouth and an elongated, spatula-like snout (called a rostrum, or bill) that makes up half the length of its body. One of the largest freshwater fish in North America, paddlefish can exceed five feet in length, weigh over 60 pounds, and live for more than 30 years (many scientists believe that they live 50 years or more). The largest American paddlefish on record, caught in Iowa, weighed 198 pounds! 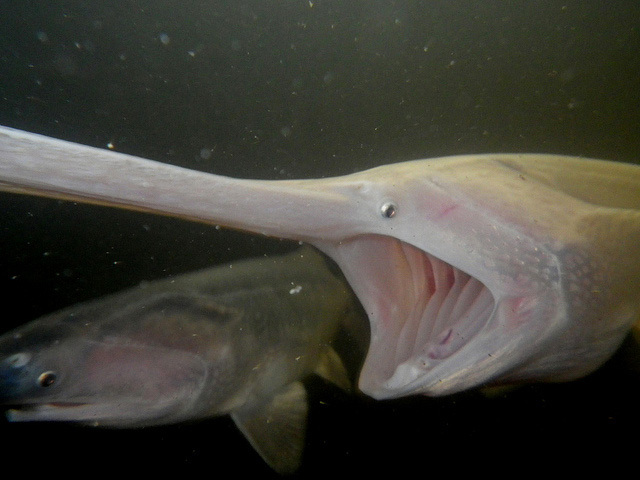 Paddlefish were once very abundant in most central U.S. river systems, but populations have declined greatly due to over fishing, sedimentation, and river modification. Paddlefish are constantly threatened by poachers because of the value of their eggs (freshwater caviar), and they are protected over a large part of their range. Paddlefish take many years before they are able to spawn. A female may take 9 to 10 years (when she has grown to about 42 inches long), and males 7 years (40 inches long) before they are able to spawn, and they may not spawn every year. Paddlefish (Polyodon spathula); artwork by Timothy Knepp / US Fish and Wildlife Service; public domain image on Wikipedia. Juvenile paddlefish. The albino paddlefish is feeding by filtering plankton from the water; photo by USFWS Mountain-Prairie on Flickr (use permitted with attribution).